I was itching to jump back in! flying around the world, somewhere! so often ideas take time to develop in my imagination. but my feathers are not all the same size! Their widths ranged from 8 1/2 to 10 1/2 inches! The middle 'column' will probably have another feather added to it? I think I'll just sleep on it! Your feathers look great. Sleeping on your ideas is good. I also find taking a photo from above helps - take a good look at it on your camera or computer and see what you think. I'm not too clever with new designs but love the second to last pic - these are going to look really great! I've been on holiday this week, I decided not to take any crafting with me (not sure why but it seemed like the right decision at the time), I'm desperate to get a needle in my hand. The feathers look amazing! I'm looking forward to seeing what ideas come from your thinking time. I love seeing all the feathers together. I have no ideas for you, but applaud the idea of letting things percolate along in your mind. Sketching can also help me sometimes, although I freely admit I am NOT an artist. But graph paper helps. 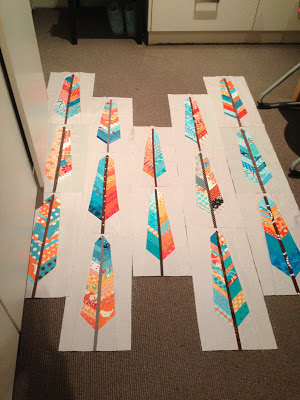 Suz, I wonder if you could find fabric to match the background well enough and add to each block to make them square. I also wonder if you could then place them on point? It seems like there might be some interesting options on point. IDK. But they do look great! I like second last best too and wonder if you could fill in with solids and quilt some feathers in cotton perle in the negative space!? Just another idea to throw in the ring! These feathers are so wonderful! I say it every time but your colour choices look so good! I like the second last photo. The way they're offset will work even if the other feather doesn't turn up. I would definitely keep them all facing the same way, and maybe try leaving two diagonally opposite corners just as solid, so that the feathers make a diagonal strip - does that make sense? What do I know!? I love the one before last picture, it looks like it is meant to be like that! Really like the second last photo- the feathers look so lovely together! Your feathers look great but I think they all need to go one way. I like them all facing one direction, as well. When I first heard that the feathers were various sizes I imagined adding to the outsides so that there would be more grey background surrounding each one as Mary suggested above.How about spreading them all out on some grey background fabric just to see what it would look like with "breathing room" around each one. 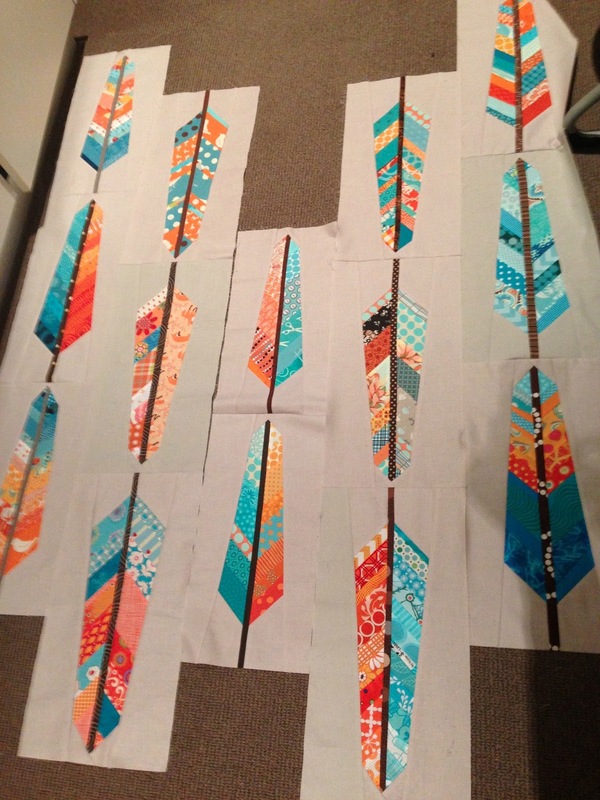 It's amazing how good they all look together...What a fun quilt you are going to have...you can't go wrong!! I love those feathers and the colour theme you went with. You know me though, I would send at least one feather off on a tangent. I am wondering how they might look with some more space, maybe some strips of your background between the columns? I like them facing the same way too but if there was more negative space it might be fun to experiment with alternating directions. Whatever you decide, the quilt will be wonderful. Gorgeous blocks and colour choices! I like the five strips together and would probably just fill in the gaps with the same colour solid - then a nice scrappy binding in the feather colours to pull it altogether! I'd volunteer to play around with the layout for you but you'd probably not get them back - they're just too gorgeous! I think these feathers are wonderful. Playing with layouts is tricky. It is times like this that digital photography is really appreciated. I think they look best in the second to last photo with all the stalks pointing down, feathers up. I would keep the number of feathers you've got and use the background fabric to fill in the gaps to finish it. I think this would be a very modern layout which matches the feathers block design. If these were my blocks, I'd play around with them a little more, especially if you're wanting to make the quilt more modern. For example, what happens when you stagger a couple columns as you have, and then turn some of them perpendicular to the column, staggering them as well. Or, because I know asymmetry is a characteristic of modern, I'd think about arranging them imbalanced. 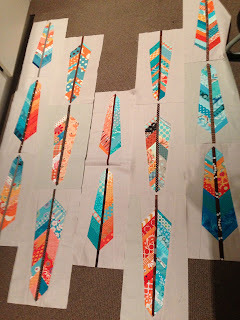 Maybe leave some same-sized plain gray blocks in a few places, to create negative space, and then quilt those spaces with the same feather shape, perhaps even in the same colors. I wish I could be beside you as you try these options! I would have done as you did and trim them into strips of the closest size. 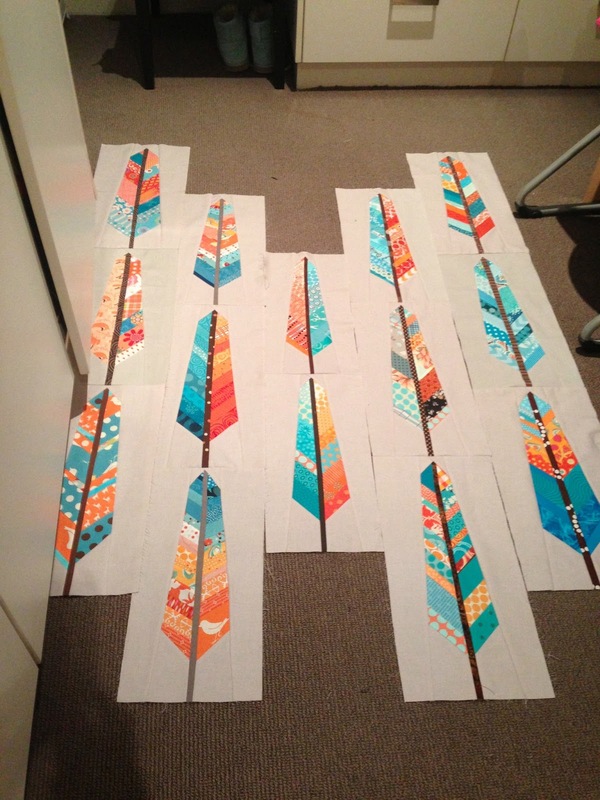 I like the feathers going different directions and the idea of leaving gaps of plain background. You are on the right track. Carry on! they are beautiful. I would make another one for the middle and then just add solid to square it up. 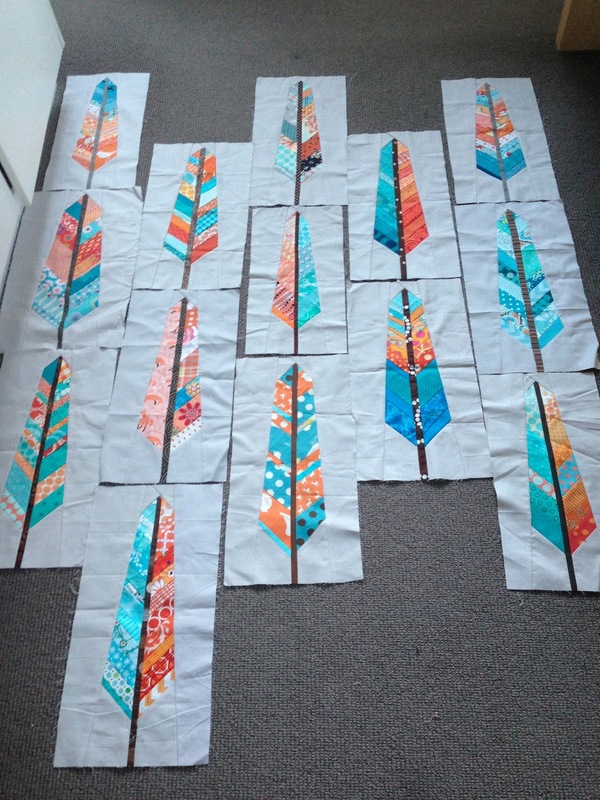 Love seeing all the feather blocks together. Sure hope that last one arrives safely to you soon. Whatever layout you come up with will be awesome I know. 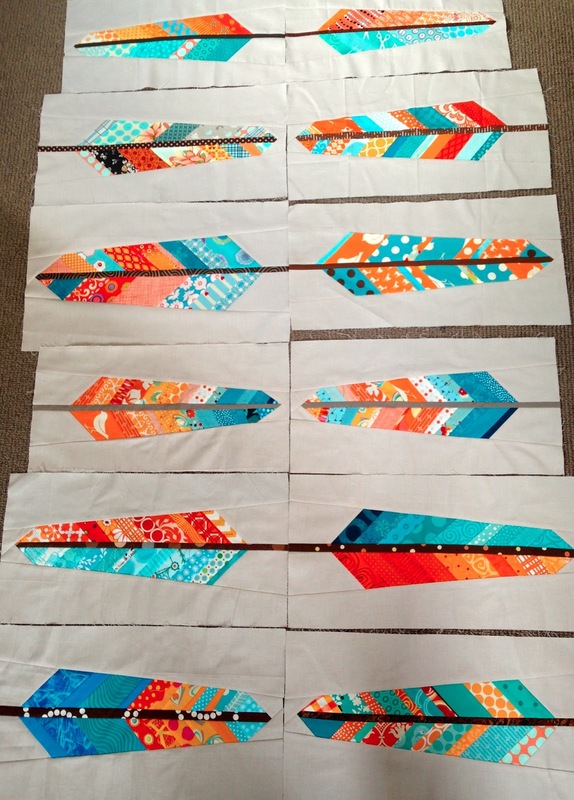 Wow, I'm relatively new to patchwork and quilting and I've never seen feather blocks before, this looks awesome. I recently had FIVE months away from my machine (we moved), after being separated (from my machine) for two weeks I told my husband I was homesick ... not for our old house but for my sewing machine!